Thank you so much for completing the survey! You are now entered to win the giveaway that will take place soon. Keep your eyes open for announcements of the winner in the Metamorphic Facebook Group. Now that the challenge is over, you may wondering what to do next. Well, wonder no more--I've got you covered! 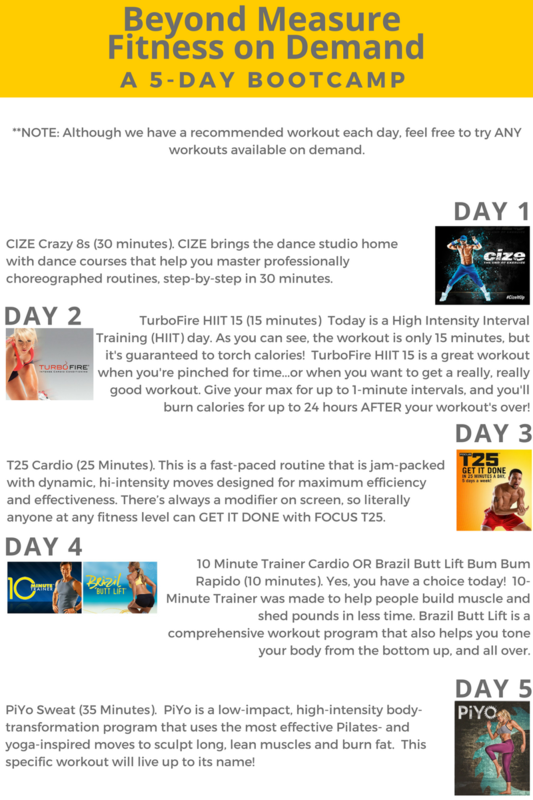 My Fitness on Demand Bootcamp is the perfect next step. ​Much like the challenge you just participated in, this is a FREE 5-day health & fitness challenge. BUT, with this challenge, I'll not only provide a workout plan, but I'll also provide a meal plan & grocery list! Download your files and click the button below to get started. WHAT IS THE FITNESS ON DEMAND BOOTCAMP? During the Fitness on Demand Bootcamp, you'll use ​Beachbody On Demand--a program that allows you to access hundreds of Beachbody workout programs from anywhere you are using your comptuer/ipad/phone...etc. You can even tap into a variety of never-before-seen workouts from our team of Super Trainers, including yoga and dance routines, calorie-burning cardio, and muscle-building strength training. With Beachbody On Demand, you get the complete workouts—end-to-end—plus step-by-step fitness guides, workout calendars, nutrition plans, and more—all online! Everything that makes Beachbody programs the #1 home fitness programs on earth! Guess what else?? The first 30 days is completely FREE! During the bootcamp, you'll use a different program each day of the challenge, so you'll get really good use out of it for the 5 days. If you continue on with Beachbody on Demand, it's $38.87 for every 90 days after your 30 day trial is up... about $3 per week for unlimited workouts. How about that for a killer gym membership?!? Download your files and click the button to get started. And don't worry, you won't be going through this journey alone. I'll be your personal Coach providing one-on-one guidance and support! In the Spring of 2012, I was diagnosed with an autoimmune disorder called discoid lupus. I lost some patches of hair on my head, but because I refused to literally be scarred by this disorder I did my homework and got to work. I learned that 3 things could make my body stop attacking itself: 1) a plant-based diet (staying away from oil since it triggers inflammation in the body), 2) routine exercise, and 3) rest. Following these three guidelines enabled me to stay medication-free since August 2014!! Triumph! Much to my dermatologist's surprise, my hair grew back and left no scarring! Yes, I slip up from time to time when it comes to following the 3 points noted above, but there is nothing like a health crisis to scare you back on track! That's why I am here, to encourage others and inspire them to join me along the way! ​I am also excited about helping you realize your potential too! I am here to inspire and motivate you! Want to lose weight? Get totally ripped? Burn serious calories? Target any goal with instant streaming access to at-home fitness. Beachbody programs get results. That's not bragging, it's the truth. My clients and other Beachbody customers keep proving it—day after day, year after year.